We are delighted to announce the West End transfer for the acclaimed historical two-part thriller IMPERIUM – I: Conspirator and II: Dictator, running for a limited engagement at London’s Gielgud Theatre from 14 June to 8 September 2018. Robert Harris’ best-selling Cicero trilogy is adapted for the stage by Mike Poulton as six one-act plays, presented in two performances, each with two intervals. Directed by RSC Artistic Director Gregory Doran, IMPERIUM transfers to London following its recent sold-out run at the Swan Theatre in Stratford-upon-Avon. Richard McCabe reprises his role as Cicero (Olivier and Tony Award-winner for The Audience and BBC’s Collateral) and Joseph Kloska returns as Tiro (RSC’s Written On The Heart and Netflix The Crown). Further cast will include Nicholas Boulton, Guy Burgess, Daniel Burke, Jade Croot, Peter De Jersey, Joe Dixon, John Dougall, Michael Grady-Hall, Oliver Johnstone, Paul Kemp, Patrick Knowles, Hywel Morgan, David Nicolle, Siobhan Redmond, Patrick Romer, Christopher Saul, Eloise Secker and Simon Thorp. Further casting is still to be confirmed. Told through the watchful eyes of Cicero’s loyal secretary, IMPERIUM – I: Conspirator chronicles how the great orator’s early success unwittingly paves the way for a brutal and bloody end to the Republic. With Rome in chaos at the beginning of IMPERIUM – II: Dictator, Cicero must use all his brilliance to restore the power of the Senate from the civic mob and their would-be Emperor, one Julius Caesar. International best-selling novelist Robert Harris is known for historical fiction. In addition to his Cicero trilogy, his books include Fatherland, Archangel, Enigma, Pompeii and The Ghost, all of which had major screen adaptations. His latest thriller Munich, based on the 1938 Munich agreement, was published in September 2017. Harris is a former BBC correspondent and columnist for The Sunday Times and Daily Telegraph. RSC Associate Artist Mike Poulton is a playwright and adapter of classical plays including works by Chekhov, Ibsen, Schiller, Euripides and Strindberg. For the RSC, Poulton’s previous adaptations have included St Erkenwald, Chaucer’s Canterbury Tales, Malory’s Morte d’Arthur and Hilary Mantel’s best-selling novels Wolf Hall and Bring up the Bodies. Gregory Doran has been Artistic Director of the Royal Shakespeare Company since 2012. His huge variety of directorial projects has included over 27 major Shakespeare productions, and a Jacobean season of plays which won an Olivier Award in 2002, as well as classics from the UK and abroad. In 2013 he instigated the RSC’s “Live From Stratford-upon-Avon”, a new programme to screen productions live from Shakespeare’s home town, including the free streaming of the productions straight to UK schools. Gregory delivered the Richard Dimbleby Lecture for the BBC in 2016. 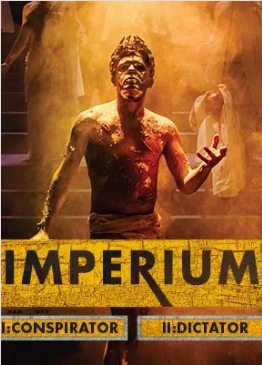 Imperium is co-produced by the Royal Shakespeare Company and Playful Productions, following their last collaboration on Mike Poulton’s stage adaptation of Hilary Mantel’s Wolf Hall and Bring up the Bodies which enjoyed success at the Aldwych Theatre after its Stratford run and transferred to Broadway in 2015.